Today Fire and Police services signed a Memorandum of Understanding (MOU) setting out the vision for greater and improved collaborative working relationships between Devon & Somerset Fire & Rescue Service, Devon & Cornwall Police, Cornwall Fire & Rescue Service and The Isles of Scilly Fire & Rescue Service. The MOU confirms the already excellent working relationship activity that the Fire and Police services carry out and how communities throughout Devon, Somerset, Cornwall as well as the Isles of Scilly will directly benefit by further delivery of joint community safety initiatives that protect the most vulnerable in our communities. Shared intelligence will assist in reducing the risk of deliberate fire setting and anti-social behaviour. These are just two of the benefits to the public that will be supported by this MOU. Alison Hernandez Police & Crime Commissioner said: “Partnership working is a key part of my police and crime plan. 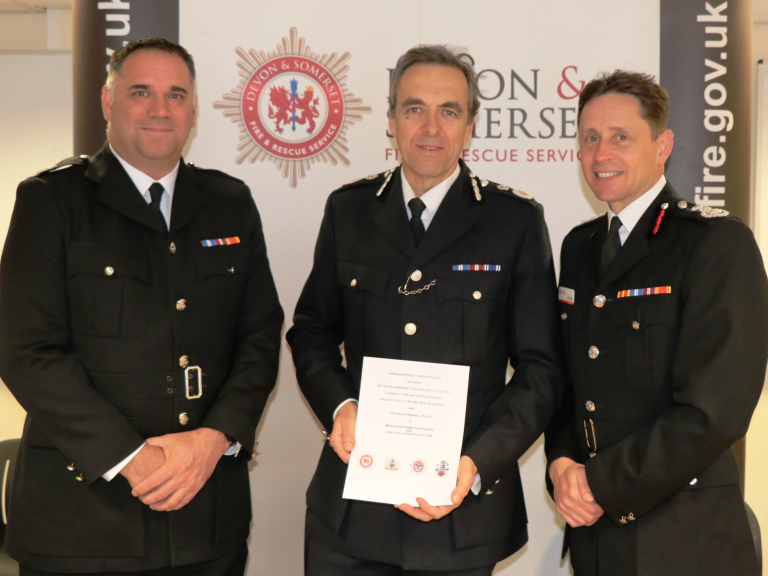 Closer collaboration between the police and local fire and rescue services is specifically highlighted in the plan, and there are already many examples across Devon and Cornwall where this is working extremely well. This provides the police with fire service resources (Urban Search and Rescue teams - USAR) to assist police in searching for high risk missing people. This includes using different search techniques depending on the missing person condition i.e. Dementia, possible suicide, etc. To date significant success has been accomplished with fire and police being deployed. A pilot is taking place in 17 fire stations within rural communities in Devon for the police to use the welfare facilities as well as interviewing members of the public who prefer not to visit a police station. The pilot is due to complete at the end of May. This allows for greater community engagement, resilience, flexibility and financial savings to both services. The community will have more opportunity to contribute and receive information on safety in their local areas. The emergency service in the South west has always worked well together. The government is committed to driving collaboration between the emergency services to deliver more effective and efficient services to the public.